Tucker Carlson had conservative attorney Harmeet Dhillon on his show on Wednesday to discuss the online crisis against conservatives. Liberal tech giants have declared war against conservatives and have thrown out free speech on their platforms. As this website has frequently reported the tech gianst including Google, Facebook and Twitter have worked overtime to silence, censor and shadowban conservative voices. 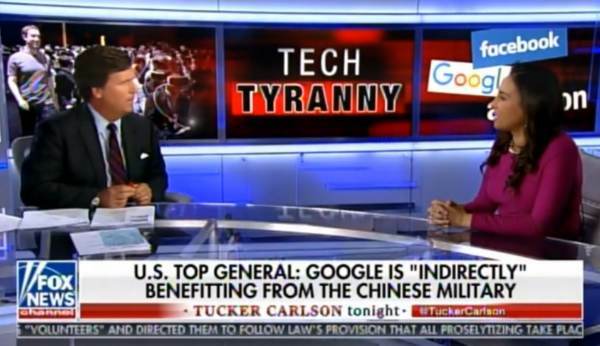 Tonight Tucker Carlson warned President Trump that if he does not deal with Google and online bias against conservatives HE WILL NOT BE ELECTED in 2020. Tucker Carlson: Do you think the president understands HE WILL NOT BE REELECTED in a free and fair election unless somebody gets a hold of this. Harmeet Dhillon: I’m not sure the whole establishment understands that… I keep saying that and so do you… I think we are in crisis mode… I we allow this to continue, if we allow this to happen in 2020 it is game over for conservatives in this country and competition in our politics.